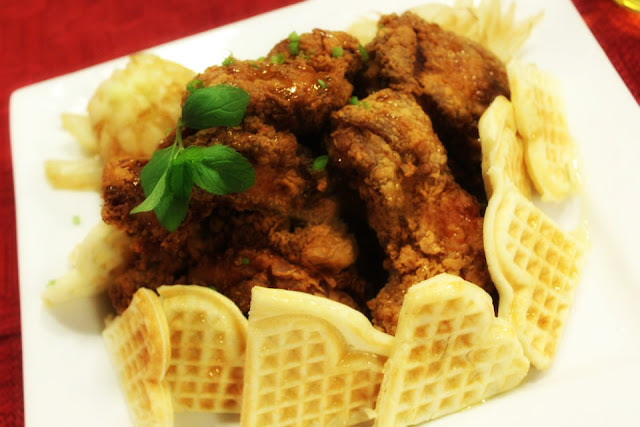 The best known chicken and waffle pairing comes from the American soul food tradition and uses fried chicken. The waffle is served much as it would be at breakfast time, with condiments such as butter and syrup. This unusual combination of foods is beloved by many people who are influenced by traditions of soul food passed down from past generations of their families. 4. Drop dipped chicken in the bag at one time. Shake to coat. 6. For waffle mixture,in a large bowl, mix together flour, salt, baking powder and sugar; set aside. 7. In a separate bowl, beat the eggs. Stir in the milk, butter and vanilla. Pour the milk mixture into the flour mixture; beat until blended. 8. Ladle the batter into a preheated waffle maker. Cook the waffles until golden and crisp. 9.Plate the Chicken with waffles and drizzle with honey.